Actinic keratosis (AK) is a UV light–induced lesion of the skin that may progress to invasive squamous cell carcinoma. It is by far the most common lesion with malignant potential to arise on the skin. See the image below. 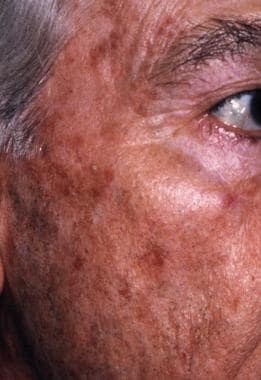 Actinic keratosis. Courtesy of Hon Pak, MD. See Nonmelanoma Skin Cancers You Need to Know and Can You Recognize Benign Skin Lesions From Cancerous Ones?, Critical Images slideshows, to help correctly identify various lesions. 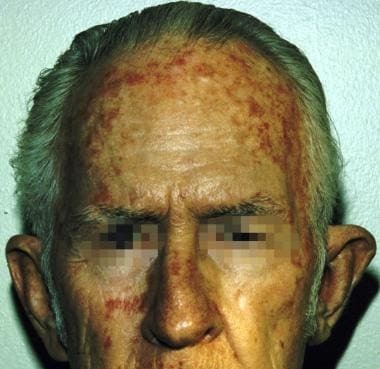 The image below is a typical depiction of actinic keratosis. Erythematous, scaly lesions on the temple area, typical of actinic keratosis. A skin biopsy is indicated to confirm the diagnosis and to rule out invasive squamous cell carcinoma for suspicious or more advanced lesions (ie, those with more pronounced hyperkeratosis, increased erythema, or induration or nodularity). [8, 9] A biopsy is also indicated for recurrent lesions or those that are unresponsive to therapy. In 2009, Criscione and colleagues conducted a study examining the progression of actinic keratoses to squamous cell carcinoma and basal cell carcinoma. The study examined 7784 actinic keratoses in a high-risk population and found that nearly 65% of primary squamous cell carcinomas and 36% of primary basal cell carcinomas arise from clinically diagnosed actinic keratoses. Furthermore, risk of progression of actinic keratosis to squamous cell carcinoma was 0.60% at 1 year and 2.57% at 4 years, which is 6-8 times more frequent than has been reported in some prior studies. Although it is impossible to predict which individual lesion will follow which course, as most patients have many lesions, accessing risk becomes more significant and aids in tailoring treatments. Overall, actinic keratoses can be safely and effectively eradicated, and, therefore, therapy is warranted. Actinic keratoses are induced by UV light. Both epidemiologic observations and molecular biologic characteristics of the tumor cells suggest UV light is sufficient by itself to induce actinic keratosis. [19, 26] Sensitivity to UV light is inherited; actinic keratoses occur more frequently in fair, redheaded, or blonde patients who burn frequently and tan poorly. Increased sun exposure and higher-intensity exposure increase the chance of actinic keratosis development. Immunosuppression following organ transplantation dramatically increases the risk of developing actinic keratoses  ; however, actinic keratoses do not occur without sun exposure. Most actinic keratoses do not progress to invasive squamous cell carcinoma; however, most invasive squamous cell carcinomas have evidence of a preexisting actinic keratosis. [5, 23] Invasive squamous cell carcinoma may produce significant morbidity by direct extension into facial structures. In less than 10% of cases, invasive squamous cell carcinoma may metastasize, with a low 5-year survival rate. [36, 37] The opportunity for them to develop into invasive squamous cell carcinomas can be prevented by aggressive therapy and sun protection. However, the prognosis in a person with long-term exposure is more guarded because of the multitude of their lesions. Encourage patients to wear sunscreens, to limit sun exposure, and to adjust their hobby or profession to decrease sun exposure. For patient education resources, see the Skin Conditions & Beauty Center. Additionally, see the patient education article Skin Cancer. Roewert-Huber J, Stockfleth E, Kerl H. Pathology and pathobiology of actinic (solar) keratosis - an update. Br J Dermatol. 2007 Dec. 157 Suppl 2:18-20. [Medline]. Schwartz RA. Premalignant keratinocytic neoplasms. J Am Acad Dermatol. 1996 Aug. 35(2 Pt 1):223-42. [Medline]. Schwartz RA, Bridges TM, Butani AK, Ehrlich A. Actinic keratosis: an occupational and environmental disorder. J Eur Acad Dermatol Venereol. 2008 May. 22(5):606-15. [Medline]. Frost CA, Green AC, Williams GM. The prevalence and determinants of solar keratoses at a subtropical latitude (Queensland, Australia). Br J Dermatol. 1998 Dec. 139(6):1033-9. [Medline]. Salasche SJ. Epidemiology of actinic keratoses and squamous cell carcinoma. J Am Acad Dermatol. 2000 Jan. 42(1 Pt 2):4-7. [Medline]. Franceschi S, Levi F, Randimbison L, La Vecchia C. Site distribution of different types of skin cancer: new aetiological clues. Int J Cancer. 1996 Jul 3. 67(1):24-8. [Medline]. James C, Crawford R, Martika M. Actinic Keratosis. James C, Crawford R, Martika M, Marks R, eds. WHO Pathology and Genetics, Skin Tumors. Lyon: IARC Press; 2006. 30-33. Berhane T, Halliday GM, Cooke B, Barnetson RS. Inflammation is associated with progression of actinic keratoses to squamous cell carcinomas in humans. Br J Dermatol. 2002 May. 146(5):810-5. [Medline]. Marks VJ. Actinic keratosis. A premalignant skin lesion. Otolaryngol Clin North Am. 1993 Feb. 26(1):23-35. [Medline]. Sanmartin O, Guillen C. Images in clinical medicine. Fluorescence diagnosis of subclinical actinic keratoses. N Engl J Med. 2008 May 8. 358(19):e21. [Medline]. Spencer JM, Hazan C, Hsiung SH, Robins P. Therapeutic decision making in the therapy of actinic keratoses. J Drugs Dermatol. 2005 May-Jun. 4(3):296-301. [Medline]. Tutrone WD, Saini R, Caglar S, Weinberg JM, Crespo J. Topical therapy for actinic keratoses, I: 5-Fluorouracil and imiquimod. Cutis. 2003 May. 71(5):365-70. [Medline]. Tutrone WD, Saini R, Caglar S, Weinberg JM, Crespo J. Topical therapy for actinic keratoses, II: Diclofenac, colchicine, and retinoids. Cutis. 2003 May. 71(5):373-9. [Medline]. Fuchs J, Thiele J. The role of oxygen in cutaneous photodynamic therapy. Free Radic Biol Med. 1998 Mar 15. 24(5):835-47. [Medline]. Hantash BM, Stewart DB, Cooper ZA, Rehmus WE, Koch RJ, Swetter SM. Facial resurfacing for nonmelanoma skin cancer prophylaxis. Arch Dermatol. 2006 Aug. 142(8):976-82. [Medline]. Sherry SD, Miles BA, Finn RA. Long-term efficacy of carbon dioxide laser resurfacing for facial actinic keratosis. J Oral Maxillofac Surg. 2007 Jun. 65(6):1135-9. [Medline]. Winton GB, Salasche SJ. Dermabrasion of the scalp as a treatment for actinic damage. J Am Acad Dermatol. 1986 Apr. 14(4):661-8. [Medline]. Glogau RG. The risk of progression to invasive disease. J Am Acad Dermatol. 2000 Jan. 42(1 Pt 2):23-4. [Medline]. Leffell DJ. The scientific basis of skin cancer. J Am Acad Dermatol. 2000 Jan. 42(1 Pt 2):18-22. [Medline]. Vogelstein B, Kinzler KW. p53 function and dysfunction. Cell. 1992 Aug 21. 70(4):523-6. [Medline]. Frost CA, Green AC. Epidemiology of solar keratoses. Br J Dermatol. 1994 Oct. 131(4):455-64. [Medline]. Feldman SR, Fleischer AB Jr, McConnell RC. Most common dermatologic problems identified by internists, 1990-1994. Arch Intern Med. 1998 Apr 13. 158(7):726-30. [Medline]. Marks R, Rennie G, Selwood TS. Malignant transformation of solar keratoses to squamous cell carcinoma. Lancet. 1988 Apr 9. 1(8589):795-7. [Medline]. Criscione VD, Weinstock MA, Naylor MF, Luque C, Eide MJ, Bingham SF, et al. Actinic keratoses: Natural history and risk of malignant transformation in the Veterans Affairs Topical Tretinoin Chemoprevention Trial. Cancer. 2009 Jun 1. 115 (11):2523-30. [Medline]. Backvall H, Asplund A, Gustafsson A, Sivertsson A, Lundeberg J, Ponten F. Genetic tumor archeology: microdissection and genetic heterogeneity in squamous and basal cell carcinoma. Mutat Res. 2005 Apr 1. 571(1-2):65-79. [Medline]. Nelson MA, Einspahr JG, Alberts DS, et al. Analysis of the p53 gene in human precancerous actinic keratosis lesions and squamous cell cancers. Cancer Lett. 1994 Sep 30. 85(1):23-9. [Medline]. Fuchs A, Marmur E. The kinetics of skin cancer: progression of actinic keratosis to squamous cell carcinoma. Dermatol Surg. 2007 Sep. 33(9):1099-101. [Medline]. Cockerell CJ. Histopathology of incipient intraepidermal squamous cell carcinoma ("actinic keratosis"). J Am Acad Dermatol. 2000 Jan. 42(1 Pt 2):11-7. [Medline]. Parrish JA. Immunosuppression, skin cancer, and ultraviolet A radiation. N Engl J Med. 2005 Dec 22. 353(25):2712-3. [Medline]. Weissenborn SJ, Nindl I, Purdie K, et al. Human papillomavirus-DNA loads in actinic keratoses exceed those in non-melanoma skin cancers. J Invest Dermatol. 2005 Jul. 125(1):93-7. [Medline]. McBride P, Neale R, Pandeya N, Green A. Sun-related factors, betapapillomavirus, and actinic keratoses: a prospective study. Arch Dermatol. 2007 Jul. 143(7):862-8. [Medline]. Pfister H, Fuchs PG, Majewski S, Jablonska S, Pniewska I, Malejczyk M. High prevalence of epidermodysplasia verruciformis-associated human papillomavirus DNA in actinic keratoses of the immunocompetent population. Arch Dermatol Res. 2003 Dec. 295(7):273-9. [Medline]. Black HS, Herd JA, Goldberg LH, et al. Effect of a low-fat diet on the incidence of actinic keratosis. N Engl J Med. 1994 May 5. 330(18):1272-5. [Medline]. Drake LA, Ceilley RI, Cornelison RL, et al. Guidelines of care for actinic keratoses. Committee on Guidelines of Care. J Am Acad Dermatol. 1995 Jan. 32(1):95-8. [Medline]. Gloster HM Jr, Neal K. Skin cancer in skin of color. J Am Acad Dermatol. 2006 Nov. 55(5):741-60; quiz 761-4. [Medline]. Cooper JZ, Brown MD. Special concern about squamous cell carcinoma of the scalp in organ transplant recipients. Arch Dermatol. 2006 Jun. 142(6):755-8. [Medline]. Green A, Battistutta D. Incidence and determinants of skin cancer in a high-risk Australian population. Int J Cancer. 1990 Sep 15. 46(3):356-61. [Medline]. Moy RL. Clinical presentation of actinic keratoses and squamous cell carcinoma. J Am Acad Dermatol. 2000 Jan. 42(1 Pt 2):8-10. [Medline]. Pock L, Drlik L, Hercogova J. Dermatoscopy of pigmented actinic keratosis--a striking similarity to lentigo maligna. Int J Dermatol. 2007 Apr. 46(4):414-6. [Medline]. Gold MH. Pharmacoeconomic analysis of the treatment of multiple actinic keratoses. J Drugs Dermatol. 2008 Jan. 7(1):23-5. [Medline]. Thompson SC, Jolley D, Marks R. Reduction of solar keratoses by regular sunscreen use. N Engl J Med. 1993 Oct 14. 329(16):1147-51. [Medline]. Eaglstein WH, Weinstein GD, Frost P. Fluorouracil: mechanism of action in human skin and actinic keratoses. I. Effect on DNA synthesis in vivo. Arch Dermatol. 1970 Feb. 101(2):132-9. [Medline]. Gupta AK, Davey V, Mcphail H. Evaluation of the effectiveness of imiquimod and 5-fluorouracil for the treatment of actinic keratosis: Critical review and meta-analysis of efficacy studies. J Cutan Med Surg. 2005 Oct. 9(5):209-14. [Medline]. Loven K, Stein L, Furst K, Levy S. Evaluation of the efficacy and tolerability of 0.5% fluorouracil cream and 5% fluorouracil cream applied to each side of the face in patients with actinic keratosis. Clin Ther. 2002 Jun. 24(6):990-1000. [Medline]. Jorizzo J, Weiss J, Vamvakias G. One-week treatment with 0.5% fluorouracil cream prior to cryosurgery in patients with actinic keratoses: a double-blind, vehicle-controlled, long-term study. J Drugs Dermatol. 2006 Feb. 5(2):133-9. [Medline]. Stockfleth E, Sterry W, Carey-Yard M, Bichel J. Multicentre, open-label study using imiquimod 5% cream in one or two 4-week courses of treatment for multiple actinic keratoses on the head. Br J Dermatol. 2007 Dec. 157 Suppl 2:41-6. [Medline]. Hanke CW, Beer KR, Stockfleth E, Wu J, Rosen T, Levy S. Imiquimod 2.5% and 3.75% for the treatment of actinic keratoses: results of two placebo-controlled studies of daily application to the face and balding scalp for two 3-week cycles. J Am Acad Dermatol. 2010 Apr. 62(4):573-81. [Medline]. Ulrich C, Bichel J, Euvrard S, et al. Topical immunomodulation under systemic immunosuppression: results of a multicentre, randomized, placebo-controlled safety and efficacy study of imiquimod 5% cream for the treatment of actinic keratoses in kidney, heart, and liver transplant patients. Br J Dermatol. 2007 Dec. 157 Suppl 2:25-31. [Medline]. Lebwohl M, Swanson N, Anderson LL, Melgaard A, Xu Z, Berman B. Ingenol mebutate gel for actinic keratosis. N Engl J Med. 2012 Mar 15. 366(11):1010-9. [Medline]. Garbe C, Basset-Seguin N, Poulin Y, et al. Efficacy and safety of follow-up field treatment of actinic keratosis with ingenol mebutate 0·015% gel: a randomized, controlled 12-month study. Br J Dermatol. 2016 Mar. Vol 174(3):505-13. [Medline]. Augustin M, Tu JH, Knudsen KM, Erntoft S, Larsson T, Hanke CW. Ingenol mebutate gel for actinic keratosis: the link between quality of life, treatment satisfaction, and clinical outcomes. J Am Acad Dermatol. 2015 May. Vol 72(5):816-21. [Medline]. Rosen RH, Gupta AK, Tyring SK. Dual mechanism of action of ingenol mebutate gel for topical treatment of actinic keratoses: Rapid lesion necrosis followed by lesion-specific immune response. J Am Acad Dermatol. 2011 Nov 4. [Medline]. Boggs W. Ingenol Mebutate Gel Effective for Actinic Keratoses. Medscape. Mar 28 2013. Available at http://Available at: http://www.medscape.com/viewarticle/781629. Accessed: April 8, 2013. Lebwohl M, Shumack S, Stein Gold L, Melgaard A, Larsson T, Tyring SK. Long-term follow-up study of ingenol mebutate gel for the treatment of actinic keratoses. JAMA Dermatol. 2013 Jun. 149(6):666-70. [Medline]. Jim On SC, Haddican M, Yaroshinsky A, Singer G, Lebwohl M. Reduced degree of irritation during a second cycle of ingenol mebutate gel 0.015% for the treatment of actinic keratosis. Cutis. 2015 Jan. 95(1):47-51. [Medline]. Berlin JM, Rigel DS. Diclofenac sodium 3% gel in the treatment of actinic keratoses postcryosurgery. J Drugs Dermatol. 2008 Jul. 7(7):669-73. [Medline]. Kurwa HA, Yong-Gee SA, Seed PT, Markey AC, Barlow RJ. A randomized paired comparison of photodynamic therapy and topical 5-fluorouracil in the treatment of actinic keratoses. J Am Acad Dermatol. 1999 Sep. 41(3 Pt 1):414-8. [Medline]. Patel G, Armstrong AW, Eisen DB. Efficacy of photodynamic therapy vs other interventions in randomized clinical trials for the treatment of actinic keratoses: a systematic review and meta-analysis. JAMA Dermatol. 2014 Dec. 150(12):1281-8. [Medline]. Braathen LR, Szeimies RM, Basset-Seguin N, et al. Guidelines on the use of photodynamic therapy for nonmelanoma skin cancer: an international consensus. International Society for Photodynamic Therapy in Dermatology, 2005. J Am Acad Dermatol. 2007 Jan. 56(1):125-43. [Medline]. Kaufmann R, Spelman L, Weightman W, et al. Multicentre intraindividual randomized trial of topical methyl aminolaevulinate-photodynamic therapy vs. cryotherapy for multiple actinic keratoses on the extremities. Br J Dermatol. 2008 May. 158(5):994-9. [Medline]. McLoone N, Donnelly RF, Walsh M, et al. Aminolaevulinic acid diffusion characteristics in 'in vitro' normal human skin and actinic keratosis: implications for topical photodynamic therapy. Photodermatol Photoimmunol Photomed. 2008 Aug. 24(4):183-90. [Medline]. Tarstedt M, Gillstedt M, Wennberg Larkö AM, Paoli J. Aminolevulinic acid and methyl aminolevulinate equally effective in topical photodynamic therapy for non-melanoma skin cancers. J Eur Acad Dermatol Venereol. 2016 Mar. Vol 30(3):420-23. [Medline]. Dirschka T, Radny P, Dominicus R, et al. Photodynamic therapy with BF-200 ALA for the treatment of actinic keratosis: results of a multicentre, randomized, observer-blind phase III study in comparison with a registered methyl-5-aminolaevulinate cream and placebo. Br J Dermatol. 2012 Jan. Vol 166(1):137-46. [Medline]. Dirschka T, Radny P, Dominicus R, et al. Long-term (6 and 12 months) follow-up of two prospective, randomized, controlled phase III trials of photodynamic therapy with BF-200 ALA and methyl aminolaevulinate for the treatment of actinic keratosis. Br J Dermatol. 2013 Apr. Vol 168(4):825-36. [Medline]. Gholam P, Weberschock T, Denk K, Enk A. Treatment with 5-aminolaevulinic acid methylester is less painful than treatment with 5-aminolaevulinic acid nanoemulsion in topical photodynamic therapy for actinic keratosis. Dermatology. 2011. Vol 222(4):358-62. [Medline]. Thai KE, Fergin P, Freeman M, et al. A prospective study of the use of cryosurgery for the treatment of actinic keratoses. Int J Dermatol. 2004 Sep. 43(9):687-92. [Medline]. Actinic keratosis during treatment with topical 5-fluorouracil. Courtesy of Hon Pak, MD. Actinic keratosis right after treatment with topical 5-fluorouracil. Courtesy of Hon Pak, MD. Disclosure: Received grant/research funds from Genentech for independent contractor; Received grant/research funds from DUSA for independent contractor; Received honoraria from Leo Pharmicuticals for review panel membership.